As readers will be well aware, here at Silver Screen Slags we are very excited about the comeback of New Romantic pioneers, Visage. This week saw a variety of huge announcements from the band, including the artwork for new ten-track album, Hearts and Knives, and the debut of new single, Shameless Fashion. Shameless Fashion reveals the band are staying true to their distinctive sound, with some modern flares. Lead singer, Steve Strange's vocals sound at their peak, especially when set against the hypnotic synth-bass. Strange is joined by Robin Simon (ex Ultravox guitarist), Lauren Duvall and Steve Barnacle for the album. Shameless Fashion is available on Visage's Official Facebook page. The full version will be available to download on April 15th, with a CD single available on May 6th. 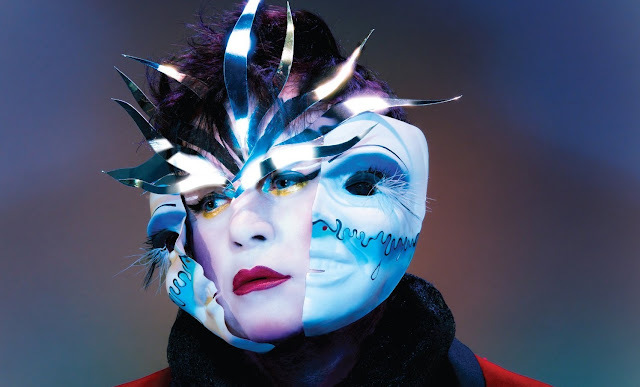 You can hear previews of all the new Visage tracks below. We'll have a review of the album in the coming month. Hearts and Knives is released on the 20th May 2013. You can pre-order a signed copy from the Visage Official Store.